Although it's just starting to appear at retail, Shiner White Wing has been in the flight pattern for about a month. Some were able to get taste of it at last month's Great American Beer Festival in Denver, while those local to the Metroplex had their chance to sample it this past weekend at Texas Brewvolution. Billed as a "delightfully odd bird", a few bottles appeared on my own doorstep this week courtesy of Shiner and the folks at McGarrah Jesse. Packaged, appropriately enough, in protective straw-like nesting material, the bottles arrived sporting black, white and gold labeling with a neck ring notation referencing Shiner's 104 years in the brewing business. Only twice in that span of time has the "little brewery" endeavored to produce a Belgian-style beer, historically staying somewhat close to the vest with brews of predominantly German influence. The first of these was FM 966 Farmhouse Ale, which debuted late in 2012. 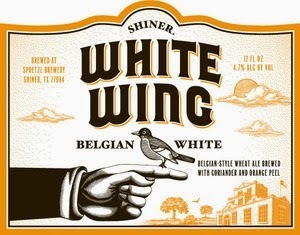 Now comes White Wing, a witbier taking the place of Shiner Hefeweizen in the brewery's year-round lineup. As are many witbiers these days, Shiner adds coriander and orange peel to an ingredient list that includes wheat and barley malt, Saaz hops and "authentic Belgian yeast." Each is noticeable in the finished product, with the spice and hop additions contributing background notes to a brew with a fairly prominent wheat grain character. In truth, the beer tastes just like it sounds and it's hard to dispute the label's claim of being a "true-to-style Belgian wheat ale." Of course, those whose tastes tend to the extremes will likely say it isn't bold enough. While it may not have the zesty fruitiness called for by the Beer Judge Certification Program (BJCP), it is undeniably refreshing, with a light creaminess and a dry, slightly tart finish. In other words, minus a few small points it's a more than fair representation of the style guidelines. Would I recommend it? Let's put it like this: if Shiner beers regularly occupy space in your refrigerator, you'll likely find White Wing to be a pleasant and enjoyable option in their portfolio. If not, I'm sure the next ultra-limited, imperial barrel-aged witbier is just around the corner. White Wing is available in six-packs of 12 oz bottles. Find it wherever Shiner beers are sold.